FOX Sports NASCAR Hangar Shoot in Daytona…This Is Cool T.V. 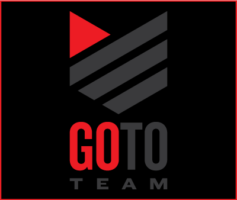 Go To Team Elite Camera Crew & Video Production Crew | FOX Sports NASCAR Hangar Shoot in Daytona…This Is Cool T.V. So, it’s been a few months since Go To Team’s Clark crew flew to Daytona Beach, FL, for the start of the 2010 NASCAR season and they’ve been busy! This year’s season started with the big ‘Hangar Shoot’ that Fox Sports uses every year to gather the artwork and story content that they’ll use throughout the season. Director Of Photography Skip Clark has been a part of the shoot for the last five years and has worked as the DP for entire project for the last three. It's raining Sparks on DP Skip Clark. This year’s highlights included a Boxing Ring, a ‘Sparks Shower,’ Go-Karts, and an LED ramp. Fellow Go To Team DP Tom Wells lensed the Boxing Ring shoot with his Varicam, ‘punch camera,’ and HVX-200. 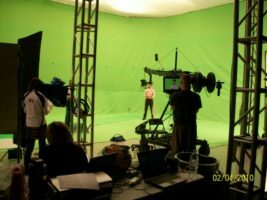 Los Angeles DP Maik Kuhne shot in the LED ramp studio where the drivers stood on a 13 foot video ramp. The LED set-up allowed Fox Sports to drop in any set of graphical elements or video that they wanted. The Go-Karts outside might have been one of the highlights for the drivers as they got to ride around a track complete with bumper tires and billboards. Each Go-Kart had a couple of POV cameras mounted to capture all the action. 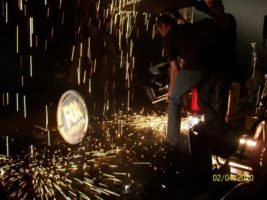 And back inside the hangar, Skip was busy shooting with the sparks rig; a 15’ wide pyro-technics rig with five arc welders custom built to create a curtain of sparks behind the driver. A sixth welder was set up with a wild line so that they techs could spray sparks right into the lens. Everything was shot with Abel-Cinetech’s Phantom Camera to capture every moment in slow-motion. 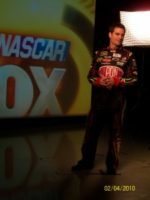 The rest of the hangar was filled out with an interview room, a 40’X60’ green screen, and a set dedicated to Fox’s newest talent, Chris Pizzi, and his segment, ‘A Slice Of Pizzi.’ Be sure to check out Fox Sports and their coverage of this year’s NASCAR season every week! Friend “Go To Team” on facebook to see the entire photo album.